Steam Team is a leading UAE car washing and cleaning company that uses the steam technology. Established in Abu Dhabi in 2009, Steam Team has introduced innovative, state-of-the-art steam equipment in washing and cleaning cars, vehicles, floors and instruments. This revolutionary, environment-friendly technology saves water as it consumes just 2 liter of water per car. No chemicals and no detergents are used here. The efficient steam machines do the best job while preserving the environment. Steam Team is the UAE’s sole distributer of this steam technology, which allows a comprehensive wash of all car parts, including the body, engine, wheel rims, mats, interior and the A/C, adding a striking brilliance & a dazzling shine to the car. Steam Team has pioneered the steam washing technology in the UAE, being the first to introduce such an innovative solution. Our services and products were highly applauded by public and private organizations alike, as well as individual clients. The new water-saving, environment-friendly technology offers a cost-effective alternative to traditional washing techniques that consume plenty of water for each and every car. In comparison, only 1.5 liter of water is enough to give your car the best wash you have ever seen! 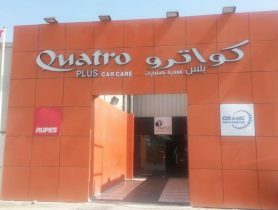 Car Service, Steam Team Car Wash & Polish Center, Car Repair Workshop in Al Mina, Car Repair Workshops in Abu Dhabi, Abu Dhabi Workshps, Car repairs in Abu Dhabi, Workhsops near me, Car Service Center in in Al Mina Abu Dhabi, Mechanic Near me, Mechanic in Abu Dhabi, Car Repair Workshops.